March 9, 2018 by Jonathan R.
There are a lot of things to love about WhatsApp, but it has its downsides too. Downsides like the barrage of messages from people you’re never going to respond to, and the dreaded giveaway that leaves nothing secret – “Last Seen” notification, so everyone knows exactly when you were online, and when their messages reached you. There are some workaroudns to preserve your privacy on WhatsApp though, and we can tell you how. 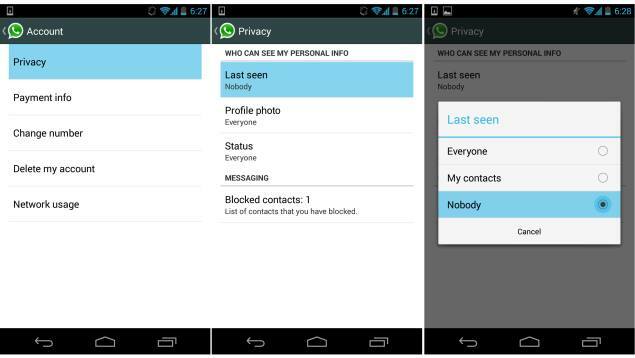 So what exactly is hide Last Seen in WhatsApp? When the information will be visible to all WhatsApp users. When the information will only be visible to users added in your WhatsApp contact list. When the information cannot be seen by any WhatsApp user and neither can you see their Last Seeninformation. Unfortunately when you are Online then the information will be visible to all. First decide what you want to set the option to, then use the following steps to change the setting, depending upon your platform. First launch Whatsapp and then click on Menu in it. Commonly it’s a 3-dots symbol on the top right-corner and for those who have a menu button in the three capacitive button at the bottom can access it from there (usually bottom left-most or right-most touch capacitive button). Under the Menu user will find Settings. 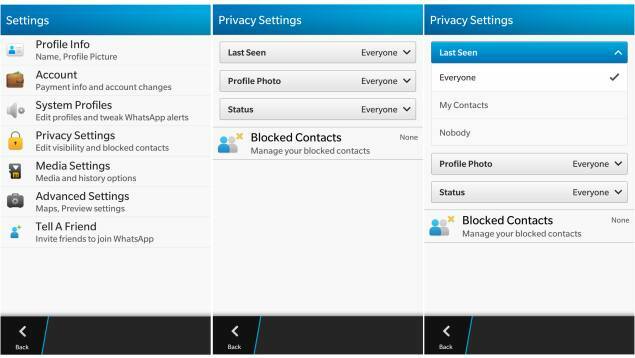 Tap on Settings and find Privacy option and select. 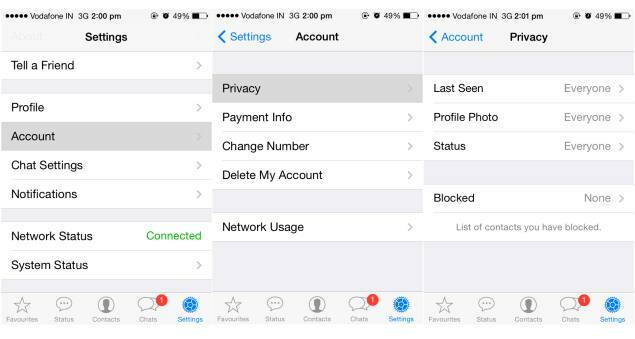 Under the Privacy, users can see the Last Seen option under Who Can See My Personal Info. Just tap on it and select whom do you want to show the information – Everyone (info will be visible to all), My contacts (Will not be visible to people other than WhatsApp contacts) and Nobody (No one can see the info and neither can you see their Last Seen info). First launch Whatsapp and then tap on Settings in it, located at the bottom right corner. Now in Settings find an option says Account. Tap on Account and then tap on Privacy in it. Now finally tap on Last seen to change it from Everyone (info will be visible to all) to My contacts(Will not be visible to people other than WhatsApp contacts) or Nobody (No one can see the info and neither can you see their Last Seen info). Tap on the Privacy Settings, and you can see the Last Seen option. Just tap on it and select whom do you want to show the information – Everyone (info will be visible to all), My contacts (Will not be visible to people other than WhatsApp contacts) and Nobody (No one can see the info and neither can you see their Last Seen info) . At present, it’s not possible to change the last seen setting on Windows Phone devices and Nokia Asha devices, though it is possible that this feature will be added to those platforms in future software updates.